~Mix together and set aside. 1. Cream together butter, sugar & eggs. Then stir in sour cream and vanilla till combined. 2. In a separate bowl, combine all dry ingredients, then add to sugar/butter mixture and stir till combined thoroughly. 3. 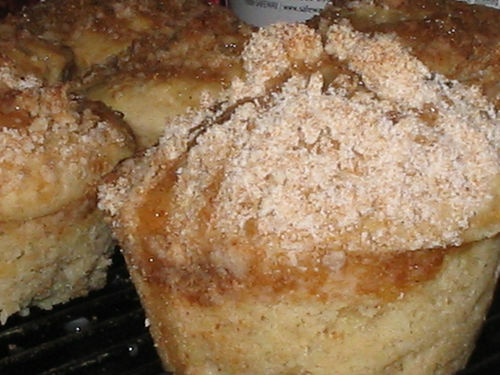 Fill muffin tins, lined with muffin papers, 1/4 way for each muffin. Add 1 T of Filling/Topping mix, then add more batter so each muffin is filled approx 2/3 of the way up. 4. Sprinkle tops evenly with the remaining topping mix. 5. Bake for approx. 20-25 minutes in a pre-heated 375* oven.